I don’t do facebook. What are the specs? The logo includes a candle, but it doesn’t look like it can tail stand! no specs yet,, just that teaser.. and price 20$ i think he said in the video.. crazy if true! I’m not a fan of the twited middle part but it might only be on the prototype. Now I really wait to see it for real, also the I6T ! Tail switch AAA ? Sounds interesting, there aren’t many of them. But I hope this version has more than one mode. I hope this version has more than one mode. Now that 47s Preons (made by Olight) are out of production, it seems Olight is going to market its own AAA clicky.. will be interesting to see if they change the driver from the Preon, or just re-use it. at 6:30 u can see the i3t shown.. looks very nice. shame no moonlight mode on it. Since the lamp hasn’t been released, maybe we could try to ask them to include a moonlight mode. ofc they are? i know that guy who died Marshall from goingear had a big impact and the reason they had moonlight on their smaller baton series… but to me its a good thing to have it doesnt hurt for sure. I was waiting for the debut’s of flashlight manufactures attending SHOT this year. Marshall was a huge contributor to the enthusiast. It still saddens me knowing he passed away. And at such a young age. It seems flashlight videos this year are few. So yeah, it’d be nice if they could implement the same thing in the i3T. Personally I can’t wait til it comes out. I will definitely be buying one. Same. Come on Olight ! Any insiders know when they might release this new model? I have no idea.. it seems they are on summer break, even the X9 light its dead quiet no release date no nothing…. i guess late summer or so they were supposed to be out in March i think but no… I so want this light it should been out long ago unless they cancelled it like the m1r..
Well the X9 has just been released : https://www.olightstore.com/olight-x9r-marauder so now they should have their hands free. I encourage interested people to contact Olight and ask them about the release date. The more of us do it, the more they will understand there’s consumer interest in that product. Any new news on the Olight i3T EOS release date yet? I see a couple of stores online getting their webpages ready, but none actually listing them for sale yet. Featuring a slim design and an exceptionally bright output, the Olight I3T EOS Dual Output LED Flashlight is the ultimate EDC illuminator! 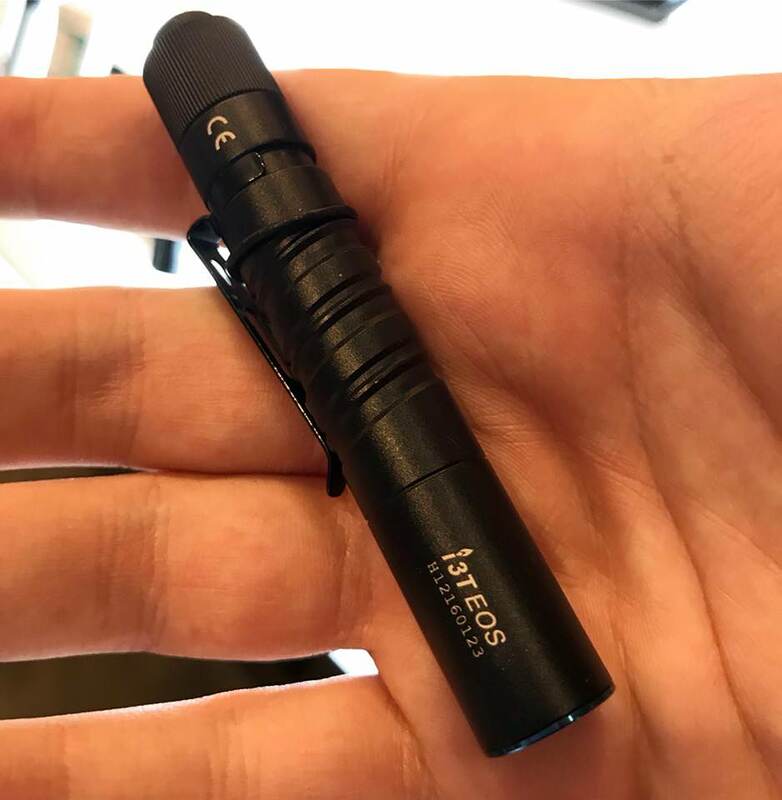 This compact torch measures just 3.5” long and comes with a handy two-way pocket clip, making it easy to carry in your pocket or bag wherever you go! Despite its small stature, the I3T EOS still packs a considerable punch, capable of emitting a 180 Lumen beam that can throw nearly 200 feet, more than enough for most everyday tasks. The handy little flashlight also comes with a secondary 5 Lumen output for when you need just a bit of brightness rather than the full force. Every inch of the I3T EOS is designed to be as ergonomic as possible for optimal user experience. The powerful light operates on just one AAA battery (included), making it one of the brightest single AAA flashlights on the market and making replacement batteries extremely easy to find. The light’s pushbutton tailcap switch makes one-handed operation crisp and easy. The EDC flashlight’s body is crafted from machined aluminum alloy, making it incredibly impact and water resistant so it’s safe to use anywhere. The body even features a unique helix-like knurling that catches the eye and provides a comfortable and secure grip. 180 lumens ? wow i will get one asap!!! 180 lm is nothing special. 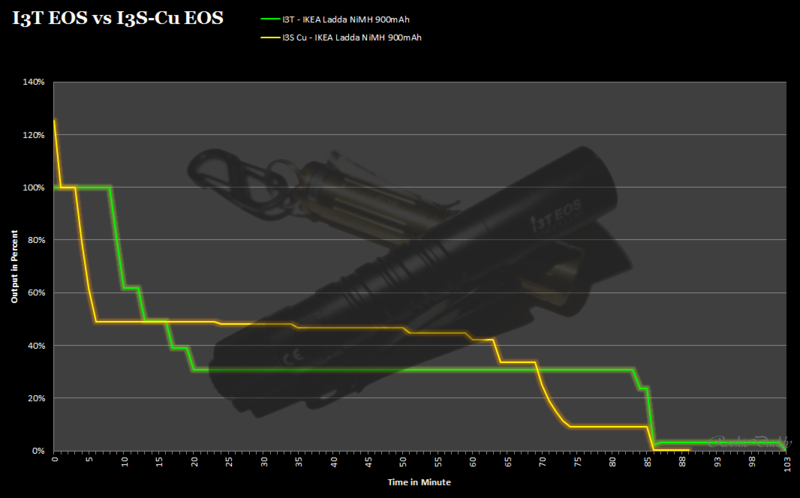 Olight i3S CU brings equal output( for 3 min, then step down to 90 lm). jaja okay, but it seems up on the russian website so we know how the package will look now. Cant be long left now so maybe it gets official next week? Thank you guys for providing early info about this light. From the cached text I’m not sure whether there are only two or multiple modes, also if there’s mode memory, but we’ll see. I think it’s still there ; just not much visible in the picture posted above.